12-year-old Casey has grown up taking care of people, especially his two young siblings and his mother, who is a heavy drug user. One day, his mother, incapacitated from drugs, is taken to the hospital leaving Casey and his two young siblings to be taken in by Child Welfare services. Casey is separated from his brother and sister and struggles with the changes that are happening to his life. 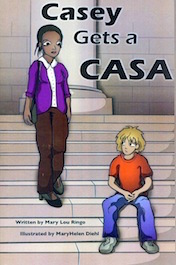 Casey is assigned a CASA to help him in his situation. This empowering story gives insight to the wonderful CASA volunteers and gives a true account of what these abandoned children struggle with when they are put into Child Welfare services.